What do you get when you combine meticulous Italian craftsmanship with the sensual, substantial feel and unsurpassed durability of the finest Egyptian cotton? Quite probably the most luxurious, comfortable, and impeccably styled bed linens you will ever own! To experience the crisp comfort and soft feel of Italian Sheets Made in Italy by Errebicasa is truly a delightful little pleasure that you can enjoy each night. Errebicasa Italian Sheets are an exquisite example of uncompromising quality and attention to detail. They are woven with a single-ply, compact cotton yarn in a special weaving process that creates an especially tight (or dense) fabric that virtually eliminates pilling and has a soothing, soft feel. All sheets are finished with a elegant classic hemstitch. Widely known as the king of all cottons, Egyptian cotton is renowned around the world for its substantial feel, distinctive luster, and amazing durability. Our Italian Sheets Made in Italy by Errebicasa are available in three thread counts: 300 Sateen (Cortina); 400 Percale (Monet); and 600 Sateen (Renoir). Thread count is simply the number of threads per square inch of fabric. Generally, the higher the thread count, the thicker and heavier the fabric or sheeting. but thread diameter is an important factor. Long staple Egyptian cotton can be woven into exceptionally narrow threads, so that a 600TC sheet made of high-quality Egyptian cotton (such as the Errebicasa Renoir sheet) will actually feel softer and thinner and have more drape than a 600TC sheet made from thicker-diameter Egyptian cotton threads or yarn. Errebicasa is one of the world's most renowned brands in high-end linens. 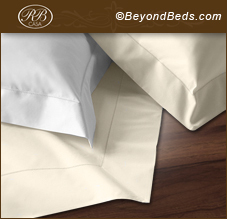 Its sheets and towels can be found in some of the world's most prestigious hotels. Their linens are made for those who believe that quality is much more than a marketing buzz word . . . and who genuinely value the style and quality of true Italian craftsmanship.